Around a year ago, Ryan bought a Samsung Epic™ 4G Android phone which, at the time, was pretty much the coolest phone in town, at least on Sprint. He loved it for its bright screen, slide-out keyboard and 4G data speeds. That last part had even me jealous. My iPhone 4 was blown away by the data speed on the Epic 4G. Problem was, the battery life on this phone was dreadful. It got to the point that his phone was only getting a few hours of standby power. Even with 4G turned off, and the supposedly incredibly efficient AMOLED screen, battery life was abismal. So when Zagg had a 50% off sale on just about everything on the site, I picked up a ZaggSparq 2.0. 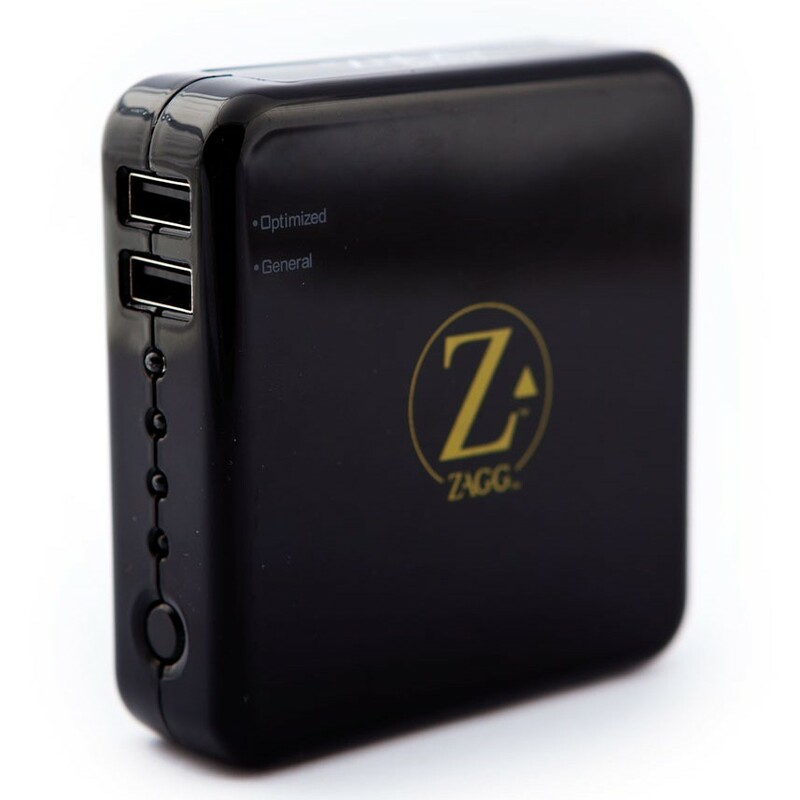 The ZaggSparq 2.0 is a portable device charger that is dead simple to use and a life-saver. On the outside it looks like a hacked black Apple MacBook Pro power adapter (3.5 x 3.5 x 1 inches). Where the MacBook Pro power adapter would have a MagSafe cable to your computer, the ZaggSparq 2.0 has two USB ports above four status lights and a status button. Inside the ZaggSparq 2.0 is a massive 6000mAh battery. Samsung’s Epig 4G battery is 1500mAh which means, in theory, the ZaggSparq 2.0 could recharge this phone four times. The iPad 2 has a 6944mAh battery* which Zagg claims can go from zero to 60% charged in the same time it takes from the iPad charger. We used the ZaggSparq 2.0 for months charging Blackberry phones, iPhones, iPads and the Epic 4G and it never failed to impress. The “Optimized” USB port charges newer/smarter devices faster using a higher amp output. Below is a “General” USB port which charges just about anything else that uses USB to charge. The dual USB ports also allow for simultaneous charging of devices, though this will obviously drain the battery faster and slow each charge. Plugged into the wall, the device seemed to charge devices at a normal speed, despite having two devices connected. Each night we could plug a Ryan’s work phone (a Blackberry) and his Epic 4G to charge while the ZaggSparq 2.0 itself charged from the wall outlet. Heavy-duty travelers rejoice, not only will this cut your charging adapter requirements in half, it allows you to charge on the go and on the spot. Owners of earlier models of the ZaggSparq reported issues with the battery holding a charge and maintaining recharge capacity. After four months of use, I cannot report any issues that have come up along those lines. Unfortunately, reviews on Amazon seem to reflect the original ZaggSparq giving it an overall rating of just two stars. Thankfully these problems seem to have been resolved with the ZaggSparq 2.0. I feel confident recommending it to anyone who finds that their smartphones and/or tablets lose power at inopportune times. I plan to borrow it for my next trip to Saudi Arabia. The ten to twelve hour battery of the iPad only gets me halfway there, this will help me survive the rest of the flight. N.B. A full phone reset on the Epic 4G fixed its battery problem but we keep the Zagg handy just in case. This entry was posted in Gadgets, Nerdiness, Review, Thoughts and tagged Android, battery extender, double your iPhone battery life, iPad, iPhone, iPhone charger, MagSafe, portable iPad battery, portable phone charger, Zagg, ZaggSparq review by Justin Scott. Bookmark the permalink. @DrewConrad Thanks! It’s an excellent product! Indeed, this seems be interesting. I’ve turned so many people on to Sparq’s that Zagg should be sending me a commission check. My first went dead after a couple of months and I was sent a replacement no questions asked. The second has had heavy, everyday use and has held up like a champ. My Zagg Sparq 2.0 has a crack in the plastic where the wall prongs pop out. If I continue to use it, the charging prongs look as if they may pull out completely. I’m three days out of the 1 year manufacturer warranty. Spent 99.99 to *infrequently* use a product for 368 days. My opinion of the Zagg charger just went from 5 glowing stars to 1 dim star of disappointment. I got an email from Zagg on Monday! They’re extending my warranty for one week, and they’re sending me a new Zagg 2.0. My faith in Zagg is restored. Back to 5 stars!!! Watch that plastic piece for cracks before your warranty runs out. I wanted to pass along this link I came across though during my search..
be helpful to others with washer issues. Thanks for such the awesome post!